"Because our patients can't talk to us, we have to figure out what's wrong with them based on physical examination and testing and histories given by their owners," said Pamela Wilkins, a professor of equine internal medicine and emergency/critical care at the University of Illinois and author of a new paper on equine neonatal intensive care. These factors are magnified in the critically ill foal, said Pamela Wilkins, a professor of equine internal medicine and emergency/critical care at the University of Illinois and the author of a new paper on equine neonatal intensive care. The paper, in Clinical Laboratory Medicine, offers guidance to the large-animal veterinarian and demonstrates the very real challenges of the job. Sickness can play havoc with a foal's blood chemistry, Wilkins said. Teasing out the causes of these changes requires that the veterinarian first understand what is normal in a newborn horse, and then how it can go wrong. To help address current gaps in knowledge, Wilkins regularly conducts blood tests or other tests, such as X-rays and CT scans, on healthy foals to determine how their body chemistry or physiology differ from that of an adult horse - or from that of a sick foal. "Roughly 3 to 7 percent of newborn foals are going to have some kind of significant health issue in the first month of life," Wilkins said. "And because our patients can't talk to us, we have to figure out what's wrong with them based on physical examination and testing and histories given by their owners." The paper also offers guidance in the use of portable "point of care" devices to measure and monitor a sick foal's changing health status. Such tools can offer immediate results in the field and cut costs associated with care. But the practitioner needs to know how to use each device and interpret the results, Wilkins said. "For example, foals with severe infections can have a very, very low or a very high glucose level," she said. Low blood glucose could be the result of the foal not taking in enough nutrients from its mother. Or the animal may not be able to make use of the glucose that is already stored as glycogen in its body. It's the practitioner's job to find out what's going on, she said. To do that, veterinarians must understand the normal fluctuations in levels of glucose and other "biomarkers" of health or disease, Wilkins said. "Blood glucose levels are going to be different between the normal, healthy adult horse and the healthy foal," she said. 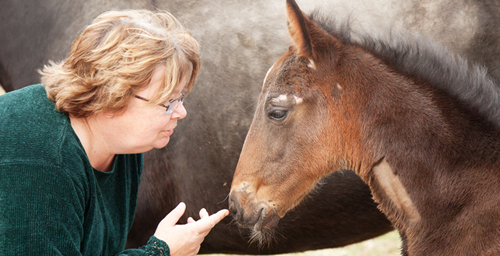 "And they're going to be different at different stages of the foal's life." Hormones, immune cells, red blood cells, protein levels, enzymes and electrolytes all vary between the adult and the infant horse, Wilkins said. And many of these markers change as the foal matures and grows. The challenges of treating sick foals don't end there, she said. A horse, even a foal, is a big, precocious animal. "Horses are a prey species, so they have to be able to get on their feet and run pretty quickly after birth," she said. "The older and slower I get, the harder it is to approach them. You spend a lot of time on your knees dealing with them, and they can kick. I get bruises all over my body during foaling season and I have no idea where they're from because I'm focused on what I'm doing." Add a very protective mother to the equation, and the task gets even trickier. "The mom needs to be there," Wilkins said. "She gets really upset if she's not." So when a foal comes into the hospital for critical care, the mother comes too. And like any mother with a sick baby, she hovers. "Figuring out a way to keep mom from pulling the IV lines out and getting upset when you're between her and the baby, that takes some doing," Wilkins said. "The mothers don't sleep; they don't lie down; they don't rest. They're on their feet with their heads hanging over their babies most of the time. So it's tough for them." If a foal needs surgery, the medical staff will sedate the mom until the foal is back at her side. Wilkins' patients may be the progeny of racehorses or performance horses, but many are also just people's pets, she said. The cost of care can be high, so owners with a strong economic or emotional incentive are most likely to bring a critically ill foal to the hospital. Despite the many challenges, Wilkins loves the work. "Foals are just wonderful, wonderful creatures," she said. "I can't imagine working with anything else in my life." Editor's note: To contact Pamela Wilkins, email pawilkin@illinois.edu. The paper, “The Equine Neonatal Intensive Care Laboratory: Point-of-Care Testing,” is availableonline or from the U. of I. News Bureau.